KRASNAYA POLYANA, RUSSIA - Darya Domracheva is so light-footed on her skis, her rivals have started comparing her with a dancer. 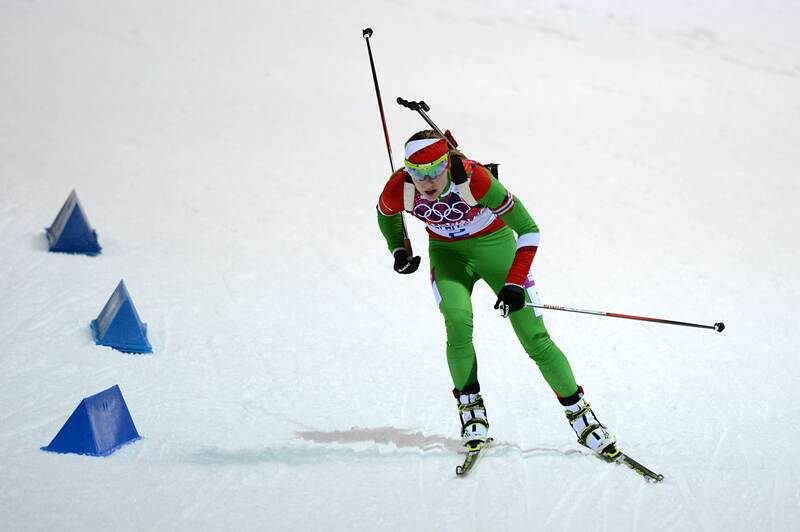 Without losing rhythm, the Belarussian eased to her third victory at the Sochi Games by winning the 12.5-km mass start race on Monday, completing an unprecedented haul of three gold medals in women’s biathlon at one Olympics. 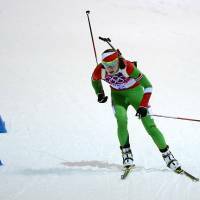 Domracheva is also expected to compete in the mixed and the women’s team relays, but Belarus is not among the favorites for gold in either race. High on confidence after wins in the pursuit and individual races last week, Domracheva took the lead after four minutes in Monday’s race and stayed ahead of the field after the first shooting. She missed one target before finishing in 35 minutes, 25.6 seconds. Kati Wilhelm is the only other woman to win three biathlon golds, but the German collected hers over two Olympics — the sprint and the relay in 2002 and the pursuit in ’06. And she needed the support at certain stages. She faulted on the fourth target in her final shooting, but as her nearest rival, Soukalova, also missed, Domracheva could still carry a 14.7-second lead into her final 2.5K lap. She stretched that lead and crossed the finish line while waving her right pole above her head in celebration. Missing on that fourth shooting cost Soukalova the chance to challenge on the final loop, but the Czech biathlete was more than happy with silver. It was Soukalova’s first Olympic medal, 30 years after her mother Gabriela Svobodova won silver in the women’s cross-country relay for Czechoslovakia. “I hope my mother is going to be happy that I am now as successful as her,” Soukalova said. Eckhoff earned her first medal, even after an unconventional way of shaking off feelings of being unwell earlier in the day. “I ate a burger and decided just have a good day,” Eckhoff said. One of the pre-race favorites, Tora Berger of Norway, fell and slid into the safety netting after crossing her skis two minutes into the race. She was clean in the first shooting but missed four targets afterward and finished 1:42.2 behind Domracheva in 15th. Other athletes fell because of the difficult conditions. Drizzle in the morning and fog until the afternoon softened the track, which had already been weakened by the mild weather last week. Olga Zaitseva slid off course in a sharp right turn and dropped her pole, and Elisa Gasparin of Switzerland also crashed. There was doubt over the race going ahead for most of the day due to thick fog hanging over the mountains above Sochi, which led to the men’s 15K mass start being postponed until Tuesday. That race, already moved from Sunday evening, was delayed in the morning and then called off in the afternoon, just before the fog started clearing at the biathlon venue.